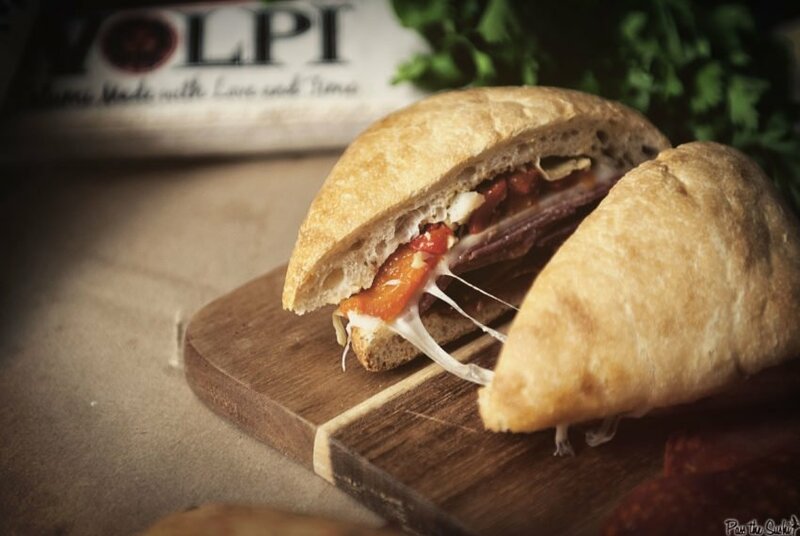 This kicking ciabatta sandwich features fun accoutrements on a nice ciabatta bread. 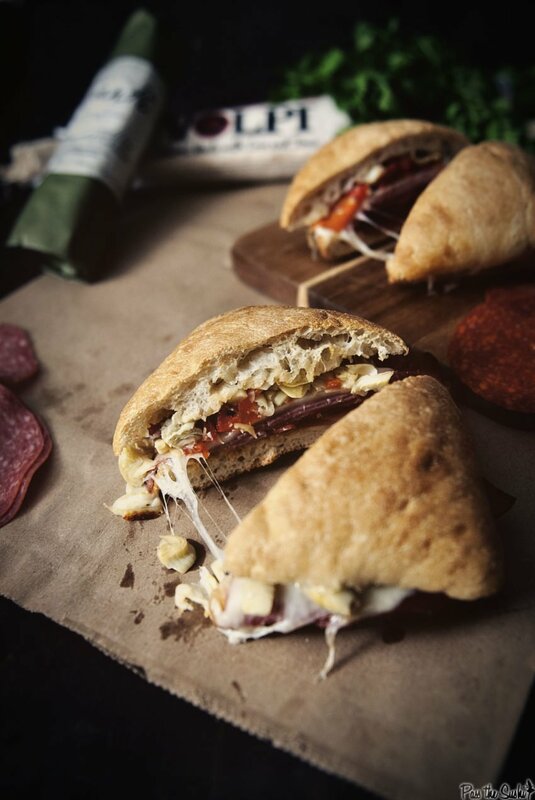 It’s portable and packed with flavor for game day. One simply does not appreciate an ‘Italian’ hoagie unless they are from Philly. I have tried these submarine sandwiches in other parts of the country. They are just depressing knock offs of what should be a joyous thing with a few thin slices of meat, piled high with wilting iceberg lettuce on a limp roll. A proper Italian hoagie is magic, covered in oil, on a perfect roll, piled high with a variety of deli meats and cheese and topped with all the trimmings. It’s something we just do right. This fancied up version isn’t an Italian hoagie. It’s a kicking sandwich with fun accoutrements on a nice ciabatta bread. It’s portable and packed with flavor but I felt the need to clarify that this wasn’t trying to be it’s big brother. It is what it is, and it’s not going to leave you disappointed. Make with whatever sliced sandwich meats you have that are needing to be used up. Don’t think too hard. Let yourself enjoy the flavors. If you’ve tried my Italian Ciabatta Sandwich recipe, or any other recipe on GirlCarnivore.com please don’t forget to rate the recipe and let me know where you found it in the comments below. I get inspired by your feedback and comments! You can also FOLLOW ME on Instagram @girlcarnivore as well as on Twitter and Facebook. More killer sandwiches? I’ve got those. These make ahead sandwiches are quick, easy, and a fun option for the big game! Mix the drained chopped artichokes and red peppers together. Preheat oven to 350 degrees. Or heat a grill to medium high. Drizzle the inside of the ciabatta rolls with a bit of olive oil. Pile the salami, chorizo, capicola and provolone evenly between each of the 4 rolls. Top with the artichoke mixture and top of rolls. Tightly wrap each sandwich in aluminum foil. Chill overnight if making ahead (*If making ahead, you may wish to reserve the oil drizzle to before heating to avoid soggy roll syndrome). Place sandwiches in oven or on pre-heated grill for 20 minutes, checking to see if heated through, and cheese is melted. GAWD!!! I wish this could be much lunch everyday! I’m drooling. Seriously. This is TOTALLY my kind of sandwich. 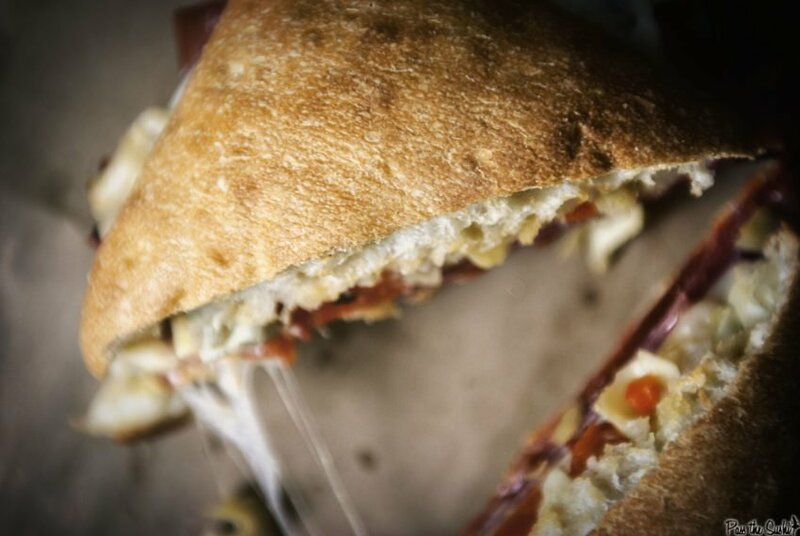 Pinned this for later…I love me some Italian Sandwiches! 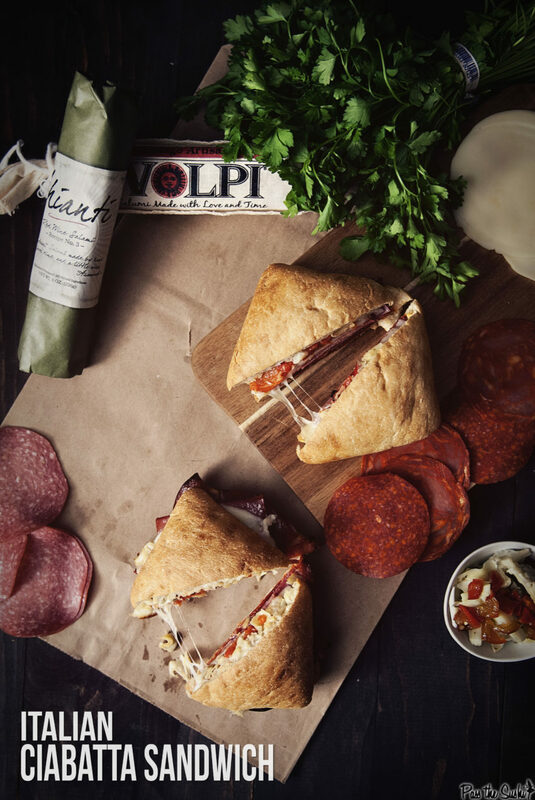 I see that you are using my most fav Salumi maker…Volpi. When I lived near St. Louis they were a favorite stop of mine. They also make the best ever guanciali which you can special order.